Utah Scientific will be participating in the IP Showcase at IBC2017, which brings together the AES, AIMS, AMWA, EBU, IAMB, MNA, SMPTE, and VSF to deliver a one-stop destination where visitors can learn to unlock the full potential of using IP for real-time media. Utah Scientific will show the latest developments in its 400 Series 3 hybrid router, and it will be one of more than 40 vendors working together to demonstrate real-world IP interoperability. At IBC2017 in Axon’s stand, Utah Scientific will showcase its all-new 400 Series 3 hybrid router and UHD-12G digital routing switcher in three demo stations: IP hybrid, Axon Cerebrum control, and 4K UHD. Highlights include a new frame controller card enabling seamless integration of the 400 Series 3 with Axon’s Cerebrum control system, as well as conversion cards for SMPTE ST 2110 and SMPTE ST 2022-6/7 that also support the previous-generation 400 Series 2 routers. In addition, Utah Scientific will preview the prototype transceiver cards it is developing for both the 400 Series 2 and 400 Series 3. 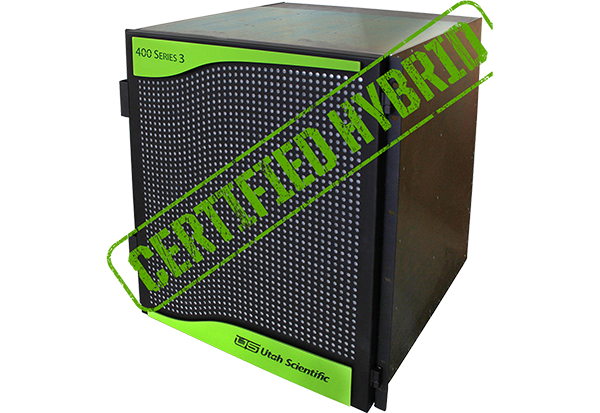 IBC2017 will mark the European debut of Utah Scientific’s new 400 Series 3 hybrid digital router, a flexible platform designed to accommodate next-generation IP signals along with today’s high-density SDI. All within a common frame, the 400 Series 3 can handle any number of IP and SDI signal formats along with audio and data. The new SMPTE ST 2110 and SMPTE ST 2022-6/7 IP formats are supported, together with 3G SDI, analog, HD, SD, and audio signals including analog, digital AES3, MADI, TDM, and AES67. The 400 Series 3 offers the flexibility of 288 I/Os of standard SDI signals with in-frame conversion of all signals to SMPTE ST 2110 or ST 2022-6/7 IP, and vice versa. The router also handles all major digital and analog audio formats, features advanced signal processing for embedding and de-embedding, and is backed by the industry’s only no-fee 10-year warranty. At IBC2017, Utah Scientific will feature its UHD-12G digital routing switcher, the industry’s first enterprise-class router to enable distribution of a full range of SDI video signals, from SD data rates up to 2160p60 data rates, in a single-link interconnect. Ideal for live acquisition of UHDTV content, the UHD-12G simplifies installations, reduces the rack space and cables needed to process 4K signals, and lowers operating expense. Ideal for enterprise broadcasters that need to meet growing consumer demand for UHDTV content, the UHD-12G is able to receive, route, and distribute SDI signals up to the latest 4K/60 standards on a single cable. The router is fully compliant with SMPTE ST 2081 and ST 2082 standards for SDI video and compatible with the full line of Utah Scientific products. In addition, the UHD-12G can be controlled by any version of Utah Scientific’s current family of routing control systems, including the SC-4, SC-40, and SC-400.